Let’s face it. To say that time flies way too fast is an understatement if you have a child. You could swear that just yesterday they were still crawling on all fours. How is it possible that they cannot be stopped from running on their feet today? Somehow you just want to freeze time. If it’s possible, you would ask your child to stop growing up so fast. You just want to remember and cherish every moment. It’s just wonderful that capturing and preserving memories of your child has now become easy and cheap. Gone are the days when buying a camera and several rolls of film are required to capture moments. Today, you can just pull out your smartphone at the right moment to snap a photo! Of course, you would want your photos to look good. Good thing though is that you do not have to be a professional to be able to capture memories well. Your photo’s composition is the major determiner of the quality of your photograph, and we will discuss this in several of the succeeding sections. For now, we will look into the gear that you use when taking photos, which also determines the quality of your photos. If you are to take your photography to the next level, perhaps you would be willing to invest in a DSLR camera. DSLR cameras produce the best quality of photos compared to point and shoot cameras or phone cameras. While they are quite expensive, some models are becoming cheaper. DSLRs are also flexible in terms of control. You can change the brightness, aperture, and shutter speed according to your taste. You can also buy different lenses for your it, depending on the purpose. DSLRs are also built to last so it would not be hard to sell if you decide to get let it go. Photos taken using DSLR are also easier to edit and enhance. It is also best for printing if you want your photos framed. On the other hand, using a DSLR also has its drawbacks. It is more expensive than other cameras. It can also get heavier and bulkier especially if you are using a big lens. DSLRs also are not convenient to carry around with you everywhere you go. It also takes time to learn how to use a DSLR so one would have to be intentional about learning its controls before being able to take full advantage of it. Point and shoot cameras are compact, light, and easy to use. With the help of today’s technology, point and shoot cameras are becoming better at producing high-quality photos with just a little adjustment with the settings and a click. What’s even more awesome about point and shoot cameras is that they are cheaper than DSLRs and are easy to bring with you wherever you go. The convenience and ease that comes with using a point and shoot camera, however, also come with sacrifices. For one, DSLRs are still superior when it comes to image quality. Point and shoot cameras are also less flexible when it comes to controls. Since its lens is fixed to the body, you do not have the option to change lenses. Still, point and shoot cameras are good for general use. When it comes to convenience, perhaps nothing beats your phone’s camera. Chances are, your smartphone will almost always be with you whenever unexpected moments occur, especially during your child’s firsts. More and more smartphones are being released with high-quality cameras. They are cheap, light, compact, and easy to use. Whenever you have to steal a moment really quickly, you can just pull out your phone, snap, and tap! You can also edit your photos right on your phone and upload them right away. However, quality-wise, while more smartphones are getting better at capturing moments, DSLRs are still superior. There is also limited flexibility when it comes to taking photos with a phone camera. Still, photo editing apps can fill some of the gaps that come with taking photos on your phone. Of course, it would not matter how good or pricey your camera is if you do not have good photos! It is also great to document the beginning of your journey as a mother right at the pregnancy stage so you might want to try taking maternity photos. Many mothers opt to hire professional photographers. Nonetheless, these tips can help give you ideas about how you want to look like or how you want your photos to be composed prior to your shoot. On the other hand, these tips can help you loads if you choose to DIY your photos. There are several things you need to remember before taking your photos. One is location. Whether it be outdoors or indoors, it is best to plan ahead. Indoor photo shoots are great if you want to make sure you control as many variables as you can, like the lighting. However, outdoor shoots are also interesting as you can include a lot of elements. Just be aware of the weather and the time of the photo shoot since lighting varies at different times of the day. Another tip is to use props. For example, you can use an article of your baby’s clothing to have a gender reveal at the same time as your maternity shoot. What you wear is also another thing you need to think about. Remember that your baby bump takes the center stage so do not be shy about wearing clothes that emphasize it! There is also beauty in baring your baby bump so if you are comfortable about showing more skin, don’t hesitate to do so. Since your baby bump has to be big enough, consider having your maternity shoot around your third trimester. Try to do it before the 35th week since it gets increasingly uncomfortable as you draw near your due date. Also, have your partner join the photo shoot. Allow yourself to be comfortable and do poses that you are both comfortable in doing. If you have older kids, take photos with them and your baby bump! Taking flattering photos while you are pregnant can be a challenge. Good thing, though, is that with the right angles and by striking a flattering pose, you can capture really great photos. Still, what you need to remember is that you are beautiful! Motherhood is a natural, wonderful process. You are strong and so be confident about your bumps and flaws. In taking maternity photos, try to explore different angles but avoid low angles in general. To emphasize your baby bump, pose at a 45-degree angle. As you pose for photos, angle your face away from your body in order to avoid a double chin. If you want a photo of you looking at your belly, look down at a slight angle and avoid directly looking down. Also, position your arms slightly apart from your torso such that they do not look enlarged. One thing you could also do is to explore different distances and crops. Long shots are great for framing and composition, especially if you are shooting outdoors. On the other hand, extreme close-ups are great at emphasizing a specific feature. For example, you can take an extreme close up of your arms around your baby bump. Medium and close-up shots also evoke different emotions. Pregnant moms also look good standing up, but you can also explore different poses like sitting down, reclining, or laying down. Just be careful as there are more angles to consider when doing various positions. If you have your partner with you, try different poses. Have their arms wrapped around you and your belly from behind. You can also have him kneeled in front and close to your baby bump. The possibilities are endless! And even more so if you have an older child. Finally, capture emotions. Intimacy, anticipation, joy, peace. Allow yourself to be comfortable to make your photos look and feel natural. Of course, do not forget to enjoy the process! Candid photos of you having fun are also precious. It would always seem like your little one has a unique ability to make time fly faster than it should. They just change every single day and this is most especially notable during your child’s first few years! For this reason, you need good photos that steal and freeze some of your little one’s first precious moments. There are two general ways by which you can capture precious moments with your little one: documentary type and posed type. Documentary types of shooting are most especially applicable during your child’s first couple of weeks, where their appearance dramatically changes. This can start as early as the child’s birth so you might want to consider hiring a photographer to document your child’s birth. It is also during the first few weeks after your child’s birth that a lot of their “firsts” happen. First time bonding meeting their grandparents, their first time nursing, first smile, and the like. On the other hand, posed types are more carefully planned. The possibilities are endless! You may choose a theme, take photos of your baby with your other children, with yourself, your partner, or their grandparents. All it takes is a spark of creativity, some photo shoot essentials, and you’re good to go. In the event that you choose to do your own photo shoot for your newborn, you would need the following: camera, good lighting, props, white noise, assistant, and loud toys. Of course, planning goes a long way. 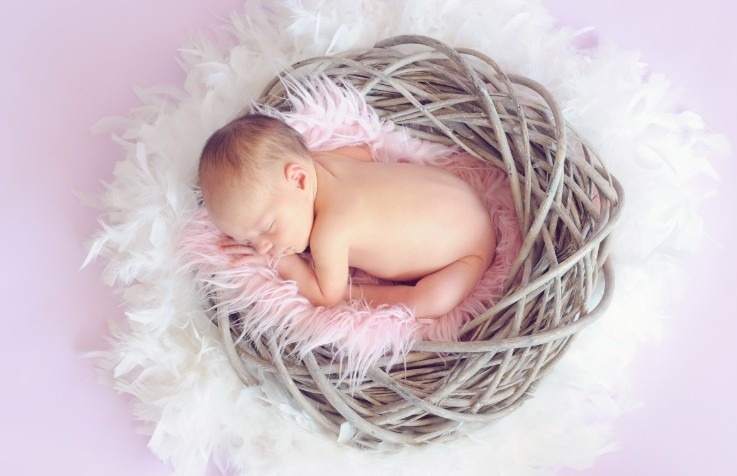 Before giving birth, you can avoid the hassle by starting to conceptualize your newborn’s shoot. This way, you can start organizing the props or materials you might need. Remember that your newborn’s photo shoot need not cost you much. With a little creativity, all the props you need may be just within your reach. Do not put too much pressure on yourself as well. You have just given birth to your baby and so you must rest as much as you can and relish each moment! Keep in mind that one advantage to this DIY photo shoot is that you hold your time. You don’t have to do everything in a single day! In doing your own photo shoots, find a place where you can get the best natural lighting and avoid using flash. You may do this indoors or outdoors. It is easier to set them on the floor or the ground. Just use some cushioning and mats, and you would not worry about them falling off the surface. Plus, you get good shots from a high angle. It is also best to feed your baby before you shoot and know the times when they are at their best temperament. You might also want to use white noise background as they sleep, and to keep the heat in the room up. While the portrait photos of newborns look immaculate, you can expect some mess behind the scenes. This is why you need an assistant to help you clean up and help your baby hold a pose. Try exploring macro shots, too. Emphasize your baby’s tiny features: their hands, toes, their lips, and the subtle changes in their expressions. Those memories are for keeps. Your newborn takes the center stage when you do your photo shoots. However, keep in mind that adding your partner or your older kids would make equally compelling photos. Do not forget to include yourself in the photos as well! Have someone else hold the camera for you once in a while. The primary goal of doing newborn photo shoots is to capture the unique innocence, serenity, and purity that naturally exudes from every newborn baby. The easiest way to capture this, of course, is to take photos in their natural poses as they sleep. Just make sure that they are comfortable and that your camera’s shutter sound does not disrupt them in their sleep. Whether they are laying flat on their backs with their arms splayed up, or if they are sleeping on their tummy, these photos would sure be precious. These are not just easy, but also safe. You can also explore other poses or hire a professional photographer to help you out. Your baby’s safety should still be the top priority. You may want to try the frog pose, which emphasizes your baby’s curves and tiny features. Also, try having them lay on their side, or curled up, and even bundled. Having their head propped on their arms or hands also helps show much of their features. Of course, not every photo can be planned and packaged perfectly. In fact, candid photos evoke a different range of emotions that posed photos could not. It would be best if you have a mix of both posed and candid photos. To be able to do this, you should always have your trusty camera close by. Do not stress yourself about having to document everything, though. Remember, it is more important that you live and enjoy the moment as it is happening. If you are using a DSLR, you can change your shutter speed depending on whether you want to capture motion or freeze it. That can really come in handy. Still, a good phone camera would suffice if you are stealing moments as they are happening. Taking photos of your children is rewarding, but it can get challenging. Kids run on endless energy and if you are caught unprepared, both you and your child might just end up feeling frustrated. And of course, it would show in the photos. Before you get your child posing for photos, you must remember that they do not have a long attention span. Make it your goal to finish shooting within an hour. Avoid all the canned poses and throw them in the bin. Allow your child to be their natural self. You see, childhood is that precious stage wherein your kid is not yet as self-conscious as adults. They just do not care much about what other people think about them and so this is a great opportunity to capture authentic moments. Instead of doing photo shoots inside a studio, try doing them outdoors and get as much natural lighting as you can. Studios can be quite intimidating not just for adults, but perhaps even more so for kids. Get down to your child’s level to make them feel more comfortable and less intimidated with you towering above them. Not only does this give the most wonderful angles, but this also allows your photo to show a deeper connection with your kid. Also, resist the urge to restrict your kid’s movements. Allow them to be free, and also allow yourself to be free. Goof around and play with them. Your child is not just a subject of your photos, and so treat them as active participants. Allow them to get goofy and creative with their poses and let them suggest ideas for photos. This way, you would capture a lot of their personality and they would also enjoy the process. It’s not always easy to make a child strike a pose, but there are a number of things you can do about it. First, time your photo shoots well. You know your child the most, so figure out when they are in their best mood. Perhaps after a meal or after a nap are good choices. Second, let kids be kids and allow them to play and goof around. This will help them to feel more comfortable, and this will also help them lose all the squirm and be more willing to cooperate in posed photographs. Third, involve them in the photo shoot process. They are not just subjects, after all. Let them use your camera once in a while. Perhaps you can let them shoot your own photos and direct your own poses. Ask for their opinion and suggestions. Fourth, play games with them. Taking photos do not have to feel like a chore to them if you can turn it into a game. They would also feel more comfortable around an adult who is not as stiff as most adults are. Fifth, respect their need for a timeout and space. Forcing kids to pose for photos would not be good for both of you, and of course, the photos themselves. While it can be convenient to let your child pull out their “say cheese” smile, chances are, the output would not be as natural as you would want to be. Good thing, though, is there are several things you can do to capture that natural smile. One thing you could do is to converse with them as you take photos. Ask them about their favorite cartoon characters or animals. Ask silly yes-no questions that will make them giggle. You can also do silly things yourself to get their attention and draw a smile or a laughter, like making funny noises. If it’s not easy for you to multitask, perhaps you can ask another person to do silly things behind you as you shoot photos. Third, you can pull the reverse psychology trick which works most of the time. Challenge your child to do their most serious face and chances are, they would just get into a laughing fit. In choosing to capture memories using your Android or iOS, the hardware is a defining factor in producing great photos. And true enough, as time passes phone companies are becoming more capable to deliver smartphones with increasingly improving cameras. Your phone’s camera is perhaps already good on its own. However, you could never go wrong in using photo apps that could help you capture better photos. Using camera apps has a lot of perks. You can choose among different shooting modes like burst, timed, slow-mo, or voice-activated. You can also choose a filter or frame. After taking your photos, you can even enhance them by changing the brightness, contrast, hue, saturation, blur, among other options. Gone are the days when high-quality photos are exclusive to professionals. Thanks to photo editing apps and software products, Instagrammable photos are now made more achievable to a wider demographic. Using photo editing apps has a lot of advantages. First, they are convenient and easy to use. Using them do not require training. With an efficient user interface, you can enhance your photos with simple swipes and taps. Second, a lot of tools are made available in photo editing apps for an affordable price or for no charge at all. Depending on the app that you use, you can adjust exposure, color, gradients, or colors. You can also quickly choose a filter among many presets to evoke the kind of effect or emotion that you want to achieve with your photos. Moreover, there are apps that allow layering of effects, like how one would use Photoshop. If you are ready to step up your digital photography game, then it is time to invest not just in a good camera, but also in photo editing software products. Post-processing plays a big role in enhancing photographs. However, a novice might be held back by the potential costs or by the thought of having to learn a complicated program like Photoshop. Worry no more, as there is a lot of photo editing software products that caters to beginners. Some of these programs are not only affordable, but some may be used for free. Granted, the best combination of photo editing software products is Photoshop and Lightroom. However, there are alternatives that have a more approachable user interface but still allows a lot of functionality. These alternatives allow a user to do basic adjustments, like color, exposure, red-eye correction, or removing spots and creases. On the other hand, there are also photo editing software products that caters to specific functions, such as resizing or zooming into photos without sacrificing the quality, removing backgrounds, or making collages. Maybe you just do not want the hassle of downloading and installing a software just to edit a couple of photos. If so, you might want to consider editing your photos straight from your browser. These online photo editors vary from beginner to expert. They work best if you are editing from your desktop, but some allow editing from your mobile device. Some of these websites may require you to sign up for an account but others allow you to edit right away. You can find the basic photo editing functions in these online editors, such as adding filters, adjusting exposure and color, and adding stickers. Others also allow correcting blemishes or creases. The more advanced ones allow using layers and masks. If you are somewhat familiar with Photoshop, then you would find the latter easy to use and friendly. From the previous sections, we found that photo editing has been made more accessible to lay users. Similarly, so is making videos. No longer do you have to learn complicated programs if you just want to compile photos or videos and add some effects. Aside from being easy to use, these photo-to-video editing apps have variations that allow you to work from your desktop, on your browser, or on your mobile device. Photo-to-video editing apps are also either affordable or free. Some basic functionalities that you may find in these apps are cutting, trimming, speeding up and slowing down a video, or adding background music. Others allow you to export your slideshows into GIFs, which is pretty neat. Moreover, you can add texts, frames, or stickers. By just dragging, clicking, swiping and tapping, you can easily make a memorable video of your little one that would surely be loved by family and friends. Documenting your little one’s life as they grow up is precious, especially for parents. As proud parents, it can be hard to resist uploading photos and videos of your little one on social media to update everyone about how things are going with your kid. However, you surely would not want to bombard all your social media contacts with photos of your child. And if you think about it, you do not know who might be looking at the photos that you share and it can be unsafe. Good thing though is there are photo sharing apps that will let you upload, organize, and document your little one’s life and share them to your closest relatives without having to show them to the rest of the world. Prices of these apps vary, but generally, there are free apps that have premium options. These apps allow you not just to share photos, but they also double as a journal of your child’s life. Like other social media sites, invited members may leave comments and they can add their own photos as well. Depending on the app, some may require invited members to install the app themselves while others allow them to view your shared photos and videos through their browsers. While made digitally, some of these apps allow options for printing into photo books, which makes scrapbooking a whole lot easier. You can also print postcards and send them via mail. Your child’s safety should always be a top priority. While sharing photos and videos of them are fun and can be a source of great delight among family and friends, not all people on the Internet are well-meaning. Photo sharing apps like mentioned above are one great way to keep your child safe. There are other ways to keep your child safe both online and offline, too. For one, you can change the privacy of the media that you share in your social media accounts to private or friends only. You may also request family members not to share photos of your child without your consent. Another thing you could do is not to give away your child’s location real time. If you can, avoid posting photos with landmarks and turn off location services on your phone. You might also want to avoid showing the Internet where your child goes to regularly so as to avoid predators targeting your child. In this digital age, you must not only protect your child but also respect their privacy. Your child may not be of age to decide on their own yet, but also think about how the media that you share might affect them in the future. Remember, once you upload it, it cannot be completely removed from the Internet. Now that you have amassed a large number of photos – whether digital or printed – you probably find yourself lost in a sea of photos. You have promised yourself to have them decluttered one of these days but you probably do not know how to start and now your photos are piling up. Sadly, being unorganized and hoarding photos render them useless, especially if you are keeping digital copies. Admit it, it’s not that fun looking at the same image taken 15 different times. Organizing digital photos can be done in several steps. First, regularly transfer your files from your memory card to your desktop. Second, group your photos and place them in separate folders according to date. Use the numerical year-month-date format so they are automatically arranged chronologically. You may also add keywords or phrases to help you know what these folders contain with just a glance. Once you have done this, go through your photos and delete the bad ones. Remember that you do not have to keep every photo. If you have 5 different shots of the same image, just choose to save the best ones. On the other hand, organizing printed photos requires you to think about where you keep all your photos. Once you’ve gathered them, you have to take extra care as they can be damaged by light or by your bare fingers. For this, consider using cotton gloves. Use a pencil to write on the back of the photos, or better yet, use sticky notes or index cards. Sort through your photos according to date and remove the bad ones. Also, keep the negatives with their printed copies. You may also sort through your photos according to events, whichever you think helps you the best. Finally, know that printed copies lose their quality over time. For this, it is highly recommended that you scan your photos and store them digitally. Worse comes to worst, you lose your digital files over a virus or you misplace your memory card. Or, a fire consumes your treasured photographs. You could never go wrong about making a backup of your precious memories should unexpected events happen. There are several ways with which you could ensure you keep your memories. You can use an external hard drive, CDs and DVDs, or cloud storage. Using an external hard drive is easy. You can purchase one that can hold a huge amount of data, like 2 Terabytes. And as time passes, they are getting more compact and they allow more and more storage. It is recommended that you regularly save not only your photos in an external hard drive but also the contents of your computer’s hard drive. On the other hand, optical storage includes CDs and DVDs. They may be rewritable or read-only. CDs hold 700 megabytes of data while DVDs can store 4.7 gigabytes of data. Blu-ray discs, on the other hand, can hold 25 gigabytes of data. Optical storage is not as big as magnetic storage (external hard drive) but they are fairly easy to use. Cloud storage, lastly, allows you to store your files online. You can also configure your device to automatically upload your files on the cloud. There are a lot of available cloud services online and the price depends on the amount of storage that you need. On the other hand, there are also free cloud services. Using USBs may also be one of your options, but they are not as durable as the other options and they may be easily lost or damaged. Choosing to store your photos online is a great idea. There is a lot of options in the market offering cloud services, too. You have probably tried Google Drive or Google Photos in saving your files. These are great not just in storage but also in sharing your files to other users. If your goal, however, is to keep your files safe, you might want to consider online backups to have your hard drive’s contents continuously uploaded on the cloud. In choosing an online backup storage provider, you must not only look at its price but also its reputation and its security. Immortalizing memories of your little one in the form of photographs is one thing. Why not take it to the next level by turning them into gifts for close relatives and friends? Not only will you have these memories frozen in time, but you can turn them into something that can be used. There are two ways to make your photos into useful gifts. First, you can make them yourself. There are tons of ideas on the Internet with helpful instructions that you can use to make your gifts into a labor of love. For example, you can make a personalized calendar, bracelet, ref magnets, collages, or frames. The other way is to look for services that offer customized photo gifts. For example, there are special printing services that can have your favorite photos printed on mugs, tumblers, pillows, or shirts. Are you looking into formally stepping up your photography game? Then online photography lessons should be the perfect fit for a busy mom like you. If you are interested in photography, you do not have to leave the comfort of your own home anymore. There is an abundance of online resources that you could access to help improve your craft at capturing moments with your little one. Costs of online photography lessons vary, from free to around $200. Whether you want to get yourself into this craft or if you just want to learn lessons on the intermediate or expert level, there is always something that would fit your needs. Through online photography lessons, you can learn more about how to use your gear, whether it be a DSLR or a smartphone. You can also learn more about framing, composition, exposure, or shooting portraits, as well as various types of photography like portrait, landscape, or low light. There are even lessons that offer to teach you how to post-process your photos with Photoshop and Lightroom. If you are looking into adding this skill into your CV, a lot of online photography lessons offer certificates for a price, as long as you fulfill the minimum requirements. Investing in good quality gear is a great idea if you really want to capture memories and keep them frozen in time. For this, you do not only need a good camera, but you also need a reliable storage system to keep your photos. You came to the right place if you do not have much idea about getting the right gear. The succeeding sections will help give you the basics and will lead you to other reliable resources. Earlier in this article, we looked into three kinds of cameras: DSLR, point and shoot, and smartphone. We have also discussed the advantages and disadvantages of using these three types. If you are looking into DSLRs, you do not have to worry too much about breaking the bank as there are entry-level options that are great for beginners. Entry-level DSLRs are especially good for those who are just beginning to learn to get into photography. On the other hand, if you want to purchase a point and shoot camera, it is better to look for a high-quality unit. Remember that smartphone cameras are now keeping up so it wouldn’t be practical to purchase a point and shoot that gives quality that a smartphone can provide anyway. Lastly, for smartphone cameras, do not just look at the megapixels. Also look into other features such as image stabilization, ISO adjustments, HDR, zoom, video quality, flash, and perhaps even water and shock resistance. If you have a DSLR and you are looking for the right lens to take photos of your little one with, the answer is that there is no single lens that is best for child photography. The reason for that is because each kind of lens serves a different purpose. However, if you are looking for a flexible lens, a medium telephoto lens would serve you well, like a 70-200mm lens. The wide zoom range is good enough for portrait or taking candid photos from a distance. On the other hand, it is recommended that you also get a portrait lens, like a 50mm prime lens. This is amazing for taking photos with beautiful blurred effects. Wide angle lenses like the 35mm are great for small spaces and for group photos. It is also great if you want to feature a lot of background or scenery into your photos. Lastly, a macro lens that like a 100mm lens is just what you need for newborn photography, especially if you want to snap beautiful photos of your baby’s tiny features. Scrapbooking has never been easier in this fast-paced digital age. If you are not the type who is into arts and crafts but would still want to preserve your little one’s memories in scrapbook style, worry not! There are now a lot of choices for digital baby books that are not only easy to use but faster to make and cheaper than handmade scrapbooks. Not only are digital baby books easier, cheaper, and faster to make, but they are also easy to share to your loved ones. Moreover, they are great at helping you keep your captured moments neat and organized. Not to mention, they double as a journal of your little one’s life. Lastly, digital baby books are also ready for printing. There is a lot of choices in the market today when it comes to external drives and it can be quite overwhelming if you are looking for one that suits your needs. In general, there are two kinds of external drives: HDD and SSD. HDD or hard disc drives are the ones the trusty hard drives we have known for so long. Inside them are magnetic moving parts that mechanically retrieve files. On the other hand, SSD or solid state drive is a newer technology. Drawing from the name itself, inside the SSD are no moving parts so all data is stored inside a microchip and is retrieved electronically. Basically, SSDs are like a bigger version of a USB memory stick. HDDs are cheaper than SSDs since the latter is a newer technology. However, SSDs are more durable and compact since it does not have a lot of parts. SSDs are also faster compared to HDDs. Still, HDDs have more storage than SSDs so far. In looking for an external drive, do not just look for storage size. Also look into how fast it can transfer files, durability, portability, and security. SD cards are convenient to use in expanding the capacity of our devices. It’s a marvel that something so small can store up to 64GB of data. And now, SD cards have more functions in that there are newer models that allow wirelessly connecting to files. With WiFi SD cards, you can know wirelessly send and receive files to and from your SD card conveniently. Not all WiFi SD cards are made equal, however. In choosing a WiFi SD card, look not only for its storage capacity but also the range and connectivity and transfer speed. You can also choose a model that allows automatic upload and viewing your photos from another device real time. The digital age now allows so much functionality like never before when it comes to taking photos and keeping them forever frozen in time. However, you cannot take advantage of this if you do not know much about the extent of possibilities that you can achieve. In this article, hopefully, you have been equipped with the essentials of all that you need to know about capturing and preserving the memories of your child. Keep in mind though, living in the moment is far more precious than taking the perfect photo!